Shakeology is one of those few products i have to have . I give it credit for helping me maintain my weight loss even when i fall off the wagon. There are a few recipes that i use and love. I am going to share one with you today, If you haven’t yet feel free to make me your coach ,and join in on the quest to get #SuperHeroRipped, Now on the Recipe! The Tropical Coconut Special is one of the easiest recipes you can try and, for me ,my go to when pressed for time. Such as late for a meeting or post workout. Speaking of which Shakeology maybe a meal replacement but it is a great post workout shake. The combination of superfoods, fast absorbing protein and phytonutrients should help reduce soreness and increase anabolic muscle growth. Mix the water and milk together first. It will reduce the thickness of the coconut milk and reduce some of the sweetness. 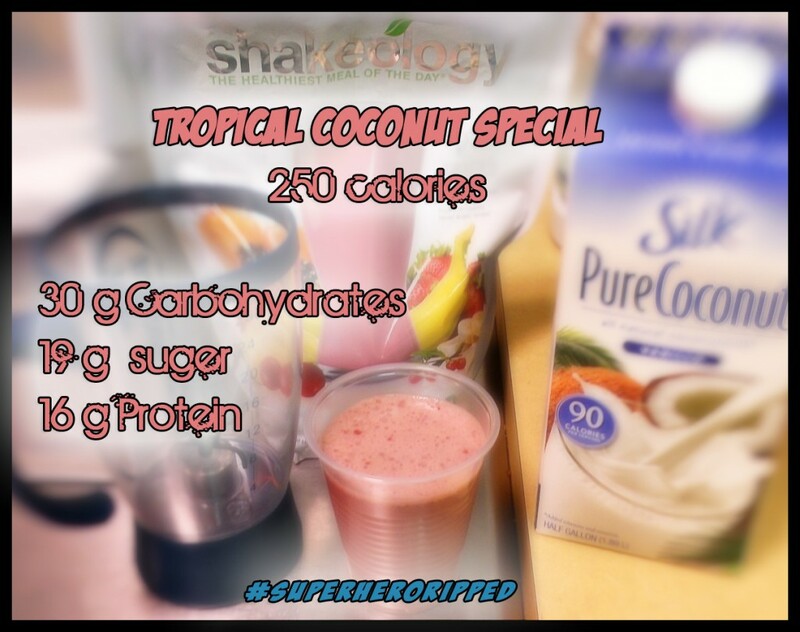 Now add a scoop of Tropical Shakeology and shake it up! what makes it special? the Coconut milk is rich in medium-chain fatty acids (MCFAs), Which have been shown to help reduce mid section fat as well as improve muscle oxidization and Adenosine-Triphosphate (ATP) uptake. ATP is actual energy you use when moving. It is what your body converts food and Fat to for use as fuel. In other words increasing your ATP is like switch from regular unleaded in your car to premium. Bonus: add additional protein if used after a heavy lifting session. I personally will mix it with a little Magnum Nutraceuticals Quattro. The Vanilla Ice Cream flavor is off the chain and will blend smoooth.